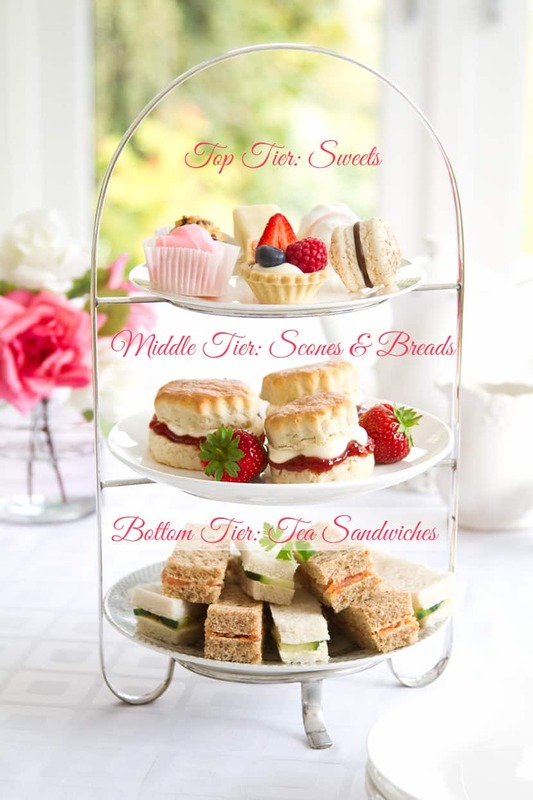 Serving Afternoon Tea doesn’t need to be difficult, or even fancy, unless you want it to be. 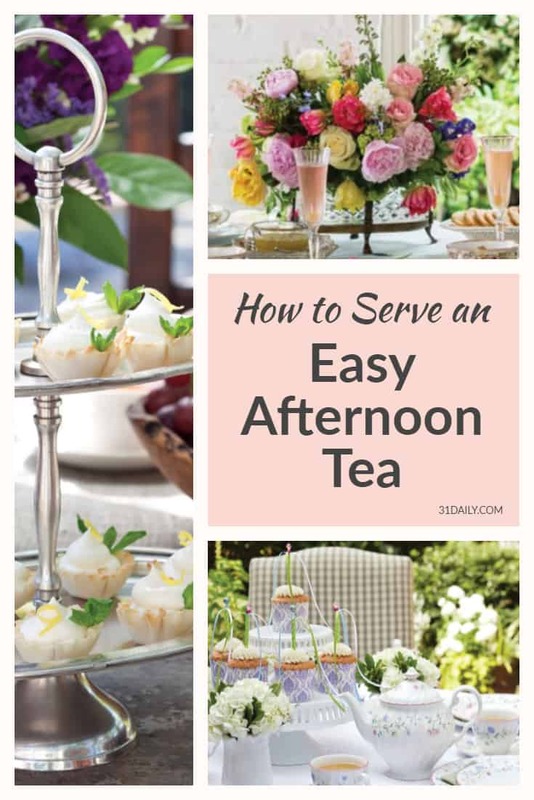 While we’ve written posts about How to Throw an Afternoon Tea Party, and Easy Make-Ahead Tea Sandwiches, this post is all about the serving of an Easy Afternoon Tea. 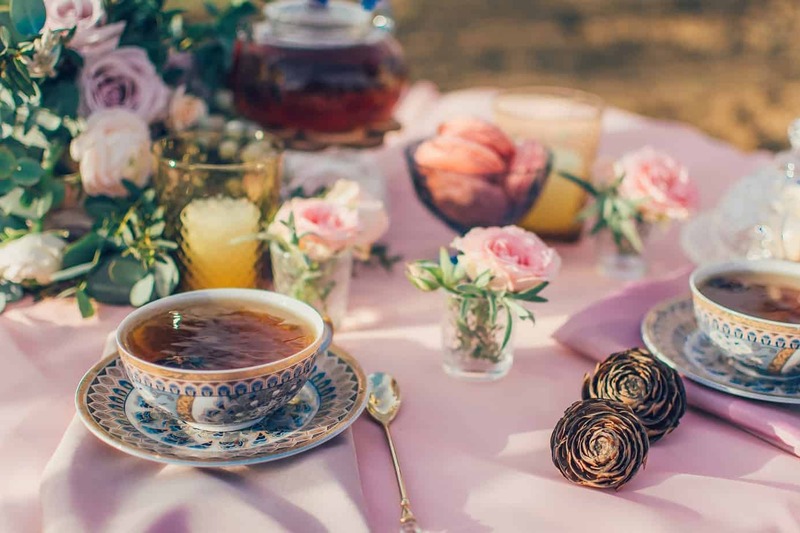 From serving decor ideas to best tea ideas, from arranging the order of your party food to tea party etiquette… and ideas on hosting a “no frills” tea party. And, we’ve even included tea party shopping ideas at the bottom of the post. 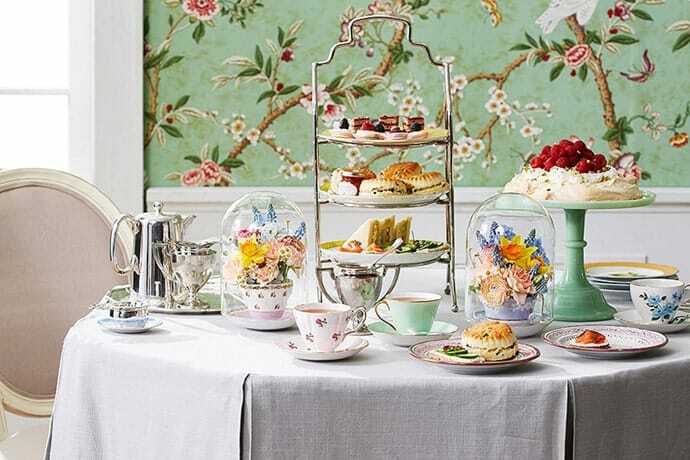 You’ll find everything you need to know, with expert advice, on hosting your own Afternoon Tea Party. 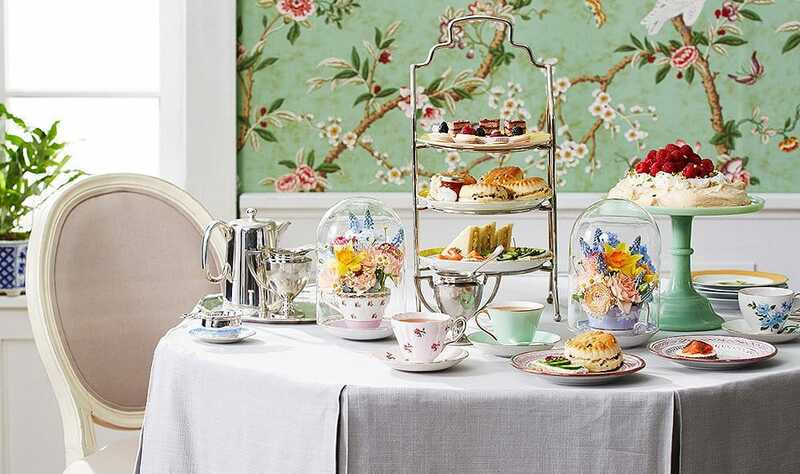 The decor sets the tone for your afternoon tea party. These ideas from the editors at Pottery Barn will add flair and flavor to your party. 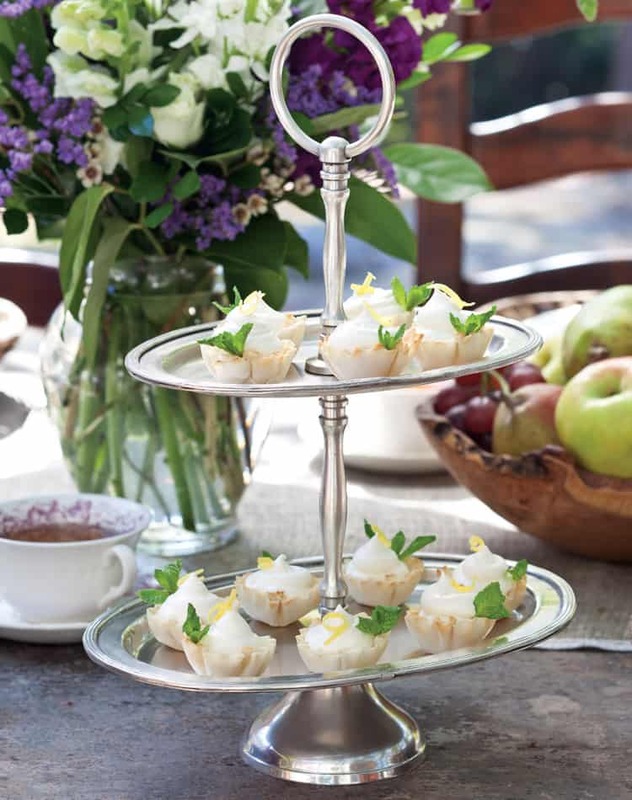 If you already have a beloved collection of cake stands, by all means use it to display your sweets and sandwiches. If you don’t have any stands, or simply don’t have enough, consider making impromptu dessert stands by placing pretty plates on top of overturned glasses, wide candle jars or soup bowls. Use plates of varying sizes and patterns, and bases of different heights for added visual interest. 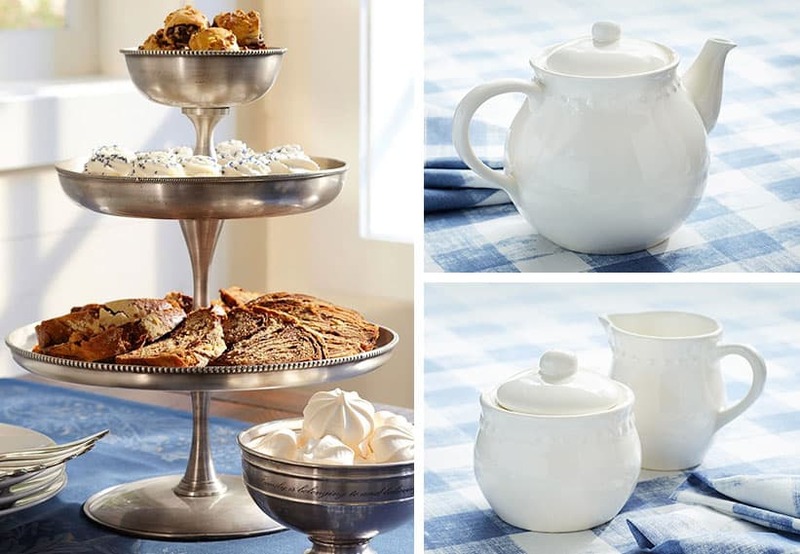 Pay close attention to your selection of teacups, plates, napkins and linens. They don’t all have to match, but coordination is key. Combine solids with florals and like-colored stripes for a sweet effect that your guests will love. If you have china, this is a great opportunity to use it. If you know you have a rowdier crew, there’s nothing wrong with using more durable options like pretty melamine or even tea-party themed paper goods. 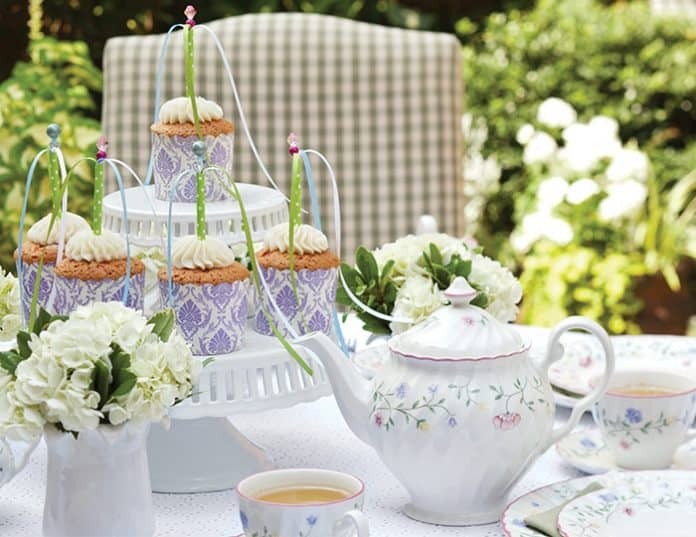 What would a list of afternoon tea party decorations be without mention of centerpieces? Even if you just have one table, adding something pretty to the center gives the room a polished look. 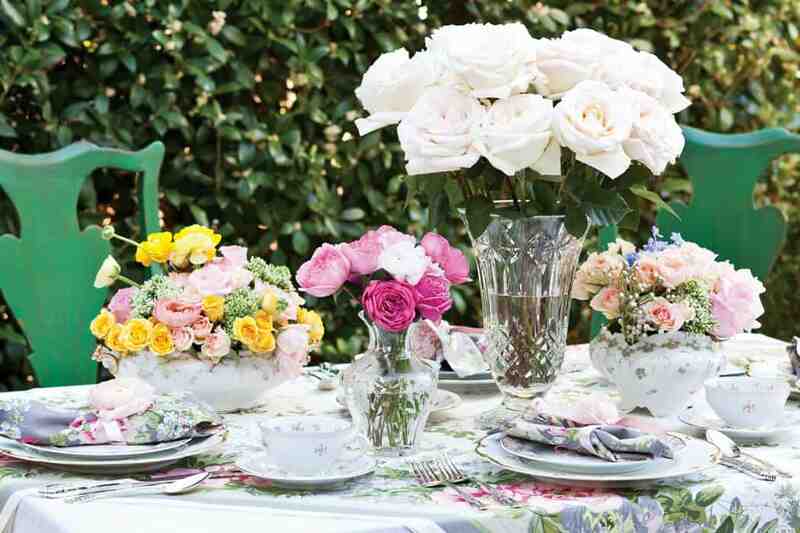 Consider using an antique teapot or oversized teacups instead of vases. Fill the vessel with arrangements of your favorite flowers. Think about keeping the arrangements low, so that people sitting across the table can see each other. Depending on the season, you might want to consider offering a mix of hot and iced teas. Or, if you’re going with a theme like a Southern sweet tea, you could stick with iced tea served in elegant glasses. Also, consider having a few pitchers of ice water handy for anyone who’s extra thirsty. Serve a variety of teas. Here are some ideas. Black teas: Bold flavored black teas are always expected for an Afternoon Tea. Examples include Earl Grey, the sharp and robust flavor of Assam or the classic afternoon tea, Darjeeling. Green teas: Lightly flavor green tea is a nice addition to the tea table. Gunpowder green tea is particularly well suited to pairing with savory sandwiches, while a mint green tea pairs nicely with sweets. Herbal teas: Lavender teas are particularly popular for afternoon tea. Serve just lavender, or a blend with another herb, like spearmint or chamomile. 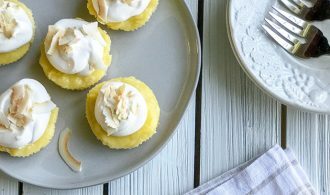 In our post, “How to Throw an Easy Afternoon Tea Party,” we’ve written in depth about tea party recipes. Be sure to check out that post. 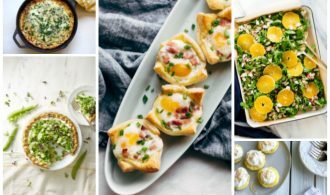 In summary, serving a variety of savory bites and sweet treats is always appreciated. 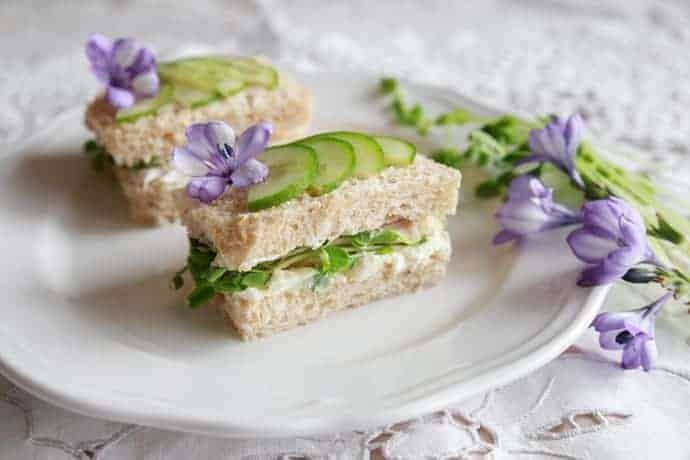 Tea sandwiches, also known as finger sandwiches, are delicate, small, crustless sandwiches that are no bigger than two to three bites. 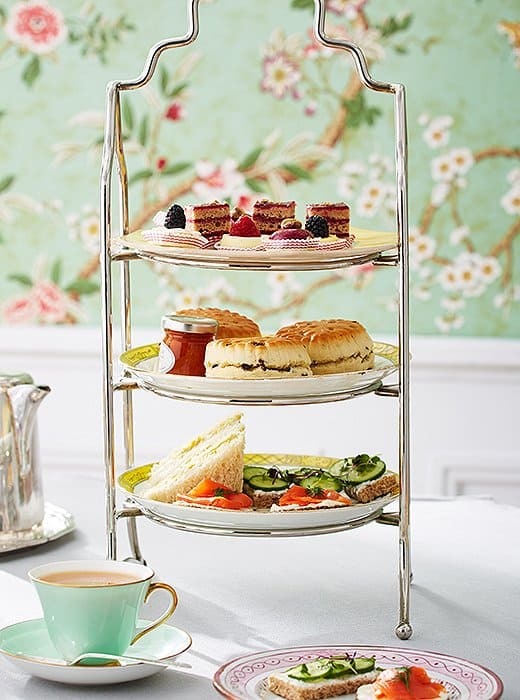 Traditional afternoon tea recipes include cucumber tea sandwiches, made with white bread, butter, cream cheese and cucumber. Crustless pumpernickel or grainy bread is perfect for making salmon tea sandwiches with thinly sliced smoked salmon and cream cheese. Another popular addition includes egg salad, chicken salad or tuna salad topped with watercress and flavorful spices. Be sure to check out our post on Easy Make Ahead Tea Sandwiches. Scones are easy to whip up the day of your afternoon tea party. Much like dense biscuits, when they’re plain and simple, these pastries are typically served alongside clotted cream and jam, or homemade preserves. You will want to see our post: Perfect Afternoon Tea Scones Recipes that are Sweet and Savory. Teacakes, shortbreads, cookies and patisserie like mini éclairs, cream puffs and petit fours are a sweet ending to your elegant meal. The making of a beautiful tea table can be arranged using a typical and traditional approach, or, you can do something all on your own. Mix it Up: If you want to do something all on your own, forego the rules and scatter single tiered stands around the table, allowing guests to choose their courses as they please. 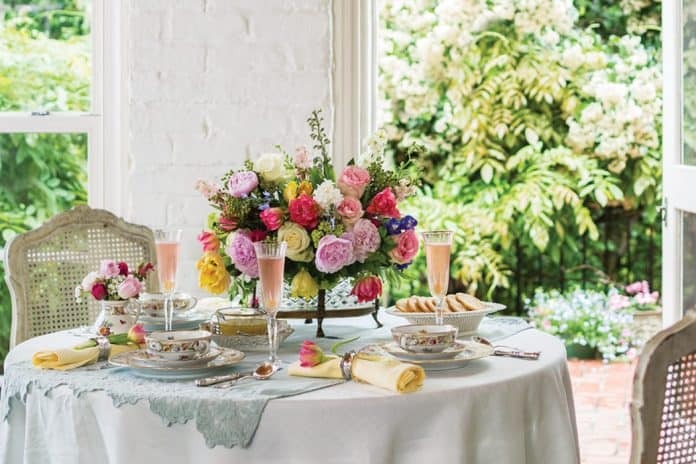 If you think tea parties must be fussy and fancy, Washington Post writer Becky Crystal has a different idea. 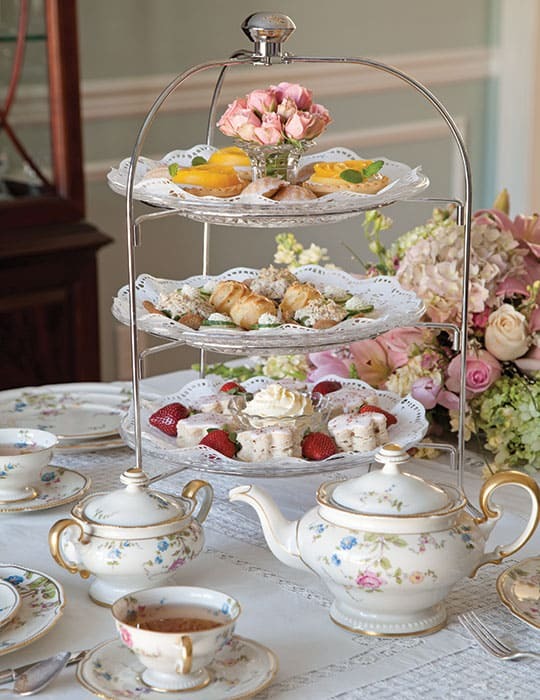 In fact, she recently shared an easy 5-Point Plan to hosting a no-frills British Afternoon Tea. 4. Make it ahead: as much as possible, make everything in advance. Bake goodies like brownies, cupcakes, layer cakes ahead, and assemble finger and tea sandwiches ahead. Scones are best baked the day of. I have shelves of etiquette books lining my bookcases, dating from the early 1800s. It’s just a thing with me. An era of charm and beauty I hope we never completely lose. Always greet your guests or host with a firm handshake. Once sat, place your handbag or clutch on your lap or for more convenience place it behind you resting against the chair – this will also stop you from slouching. When the host announces it’s time to begin your afternoon tea, take your napkin, unfold it and place it on your lap. However, if you must leave the table for any reason fold it neatly and place it on your chair. Never leave it on the table; you will ruin the beauty of the place settings and features that you or the host has spent hours preparing. If you take sugar in your tea then this must be placed into the cup first. For those of you drinking Earl Grey the traditional way, place a thin slice of lemon into the cup first. You can place sugar and lemon together in the cup but not the milk. Milk is added to the tea after you have added your tea, sugar and/or lemon (this is a preference though). “To put milk in your tea before sugar is to cross the path of love, perhaps never to marry.”1 This is a tea superstition from the French – they also recommend you put the milk in last. When your stirring your tea make sure you spoon doesn’t touch the sides of the cup and when you’ve finished place it behind the cup on the saucer – never leave the spoon in the cup. Now you must hold your cup in the correct way, never grasp your cup with both hands, you must always use the delicate handle provided. There are many debates about the ‘pinky finger’ and how it should sit when drinking tea. Some may say you must stick your little finger out however; many etiquette experts frown upon extending the pinky finger while drinking and deem it a sign of pretentiousness. We say, it’s your choice if you want to stick your pinky out then go for it! 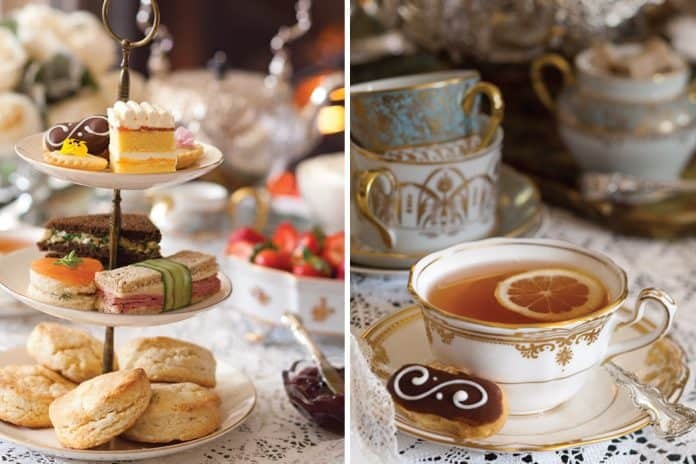 The correct order to eat the traditional afternoon tea is to eat the sandwiches and savouries first, then move onto the scones and ending on the sweets. There are many traditions and superstitions about the way you should eat your scones, the Cornish believe you should cut the scone in half and then cover it in jam then add clotted cream. The Devonshire folk believe you should cut the scone in half, cover it in clotted cream first then add a teaspoon of jam. These are the traditions they have set in place, there is no right or wrong. Try both and see what you prefer. 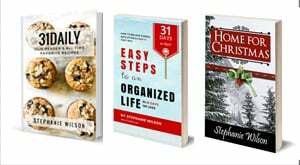 The following are Amazon.com affiliate links. If you click through and make a purchase, I may receive a commission at no additional cost to you. Book it is out of it where I can purchase it! Isn’t it gorgeous? I wish I knew what is it — it’s a favorite of mine! !